Ready for a fun adventure? 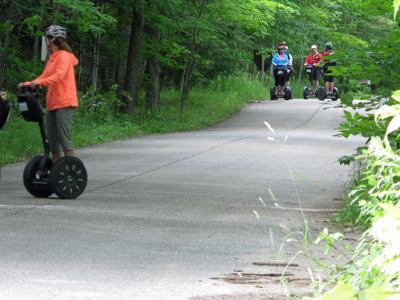 You can see Door County by car, boat, foot, bike, even cross-country skis – but have you seen Door County on a Segway? Now you can, at Segway The Door Tours! Let your Segway adventure begin! Never did it before? No worries! No experience is needed – at all! And there are several tours you can go on – even a half-day Washington Island tour. So let’s get rolling . . .
We met with Nick Dokolas, the owner of Segway The Door Tours in Fish Creek, north of the YMCA. We stepped into the small shop where you can register, purchase a few clothing items, and get ready for your Segway adventure. Nick’s been doing this since 2004, and has 43 Segway Personal Transporters (PT) ready to roll. Nick told us that Segway-ing is for anyone – even if you have never done this before. Note: Participants must be at least 11 years old, 60 pounds and steady on their feet. We arrived in time for a group that was about to start their tour to Peninsula State Park. There were about 7 participants in this one, including Anne and Mike, who you will see in the video. Josh, the Segway PT trainer, addressed the group with humor and with genuine instruction. We observed the full training of all participants. Each participant is trained individually, in front of all the rest. So everyone hears the message and instruction many times, which is good. The instruction spends about 5 minutes with each person, instructing them how to get on the Segway, how to move it forward, how to stop it, turn it right, then left, and how to dismount. All participants wear a helmet (they supply or you can bring your own). Everyone caught on very quickly, as Josh made it fun and educational. People were laughing and having a very fun time during the training, and josh was thorough. First individually, then they all rolled together to manage spacing, stopping and so on. Very thorough. And a half-day Washington Island tour (5 hours). Sometimes multiple tours are going on at the same time in different locations. Our group was heading to Peninsula State Park. When we got to the park, as we were shooting the video, Josh went over the instructions again, safely warnings about being on the roads, and they all practiced again. Safety first! We liked that they emphasized this so much. 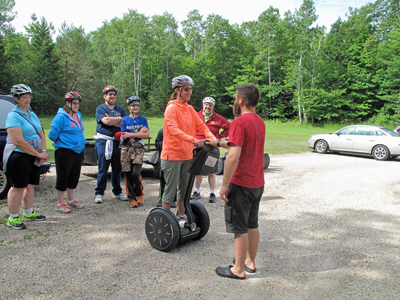 Then the group headed out on their Peninsula State park tour and all were smiling, enjoying the scenery and their Segway Personal Transporters! Our camera man and this reviewer, of course, took the Segway lessons too – and they are correct – within 5 minutes you are very good at maneuvering the Segway – and it is fun! What a fun and entertaining way to see Door County – from atop your Segway Personal Transporter. 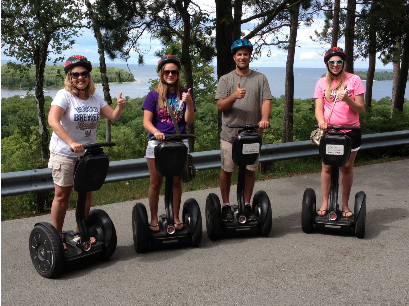 We highly recommend Segway The Door Tours! They know what they are doing and have been doing it a long time 0- and they make it fun and enjoyable. Hey – what are you doing? Get rolling and please tell them that DoorCountyNavigator.com got you moving their way!